More than 2 billion people are infected with Mycobacterium. tuberculosis; however, only 5–10% of those infected will develop active disease. Recent data suggest that containment is controlled locally at the level of the granuloma and that granuloma architecture may differ even within a single infected individual. Formation of a granuloma likely requires exposure to mycobacterial components released from infected macrophages, but the mechanism of their release is still unclear. We hypothesize that exosomes, which are small membrane vesicles containing mycobacterial components released from infected macrophages, could promote cellular recruitment during granuloma formation. In support of this hypothesis, we found that C57BL/6 mouse-derived bone marrow macrophages treated with exosomes released from M. tuberculosis-infected RAW264.7 cells secrete significant levels of chemokines and can induce migration of CFSE-labeled macrophages and splenocytes. Exosomes isolated from the serum of M. bovis bacillus Calmette-Guérin–infected mice could also stimulate macrophage production of chemokines and cytokines ex vivo, but the level and type differed during the course of a 60-d infection. Of interest, the exosome concentration in serum correlated strongly with mouse bacterial load, suggesting some role in immune regulation. Finally, hollow fiber-based experiments indicated that macrophages treated with exosomes released from M. tuberculosis-infected cells could promote macrophage recruitment in vivo. Exosomes injected intranasally could also recruit CD11b+ cells into the lung. Overall, our study suggests that exosomes may play an important role in recruiting and regulating host cells during an M. tuberculosis infection. Mycobacterium tuberculosis is an intracellular pathogen and the causative agent of tuberculosis (TB). An estimated 1.7 million individuals died of TB in 2009, and another eight million were infected (1). Although >2 billion people have been infected with M. tuberculosis, only 5–10% of those infected will develop active disease (2). This percentage increases dramatically in HIV/M. tuberculosis–coinfected patients. Evidence suggests a robust immune response in both individuals who control as well as those who succumb to infection; however, the molecular and immunological mechanisms that dictate control or susceptibility remain mostly undefined. Nevertheless, recent data suggest that containment, or lack thereof, is controlled locally at the level of the granuloma (3–5). In humans these dynamic structures consist of a caseated center surrounded by activated macrophages, fibrotic tissue, and lymphocytes (6). The formation of these granulomas requires cytokines such as TNF-α as well as chemotactic factors to promote recruitment and activation of macrophages and later T cells (7). Infected macrophages are considered the primary producers of these mediators, but published data also indicate that mycobacterial components can facilitate granuloma formation (8, 9). However, the mechanism by which these mycobacterial components gain access to the extracellular milieu has not been determined. We hypothesized that exosomes released from infected macrophages in vivo might be the carriers of these mycobacterial components. Exosomes are 30- to 100-nm microvesicles of endocytic origin, which are secreted by hematopoietic and nonhematopoietic cells (10, 11). They are known to function in intercellular communication, including Ag presentation and T cell activation (12), as well as immune suppression (13). Exosomes isolated from macrophages infected with M. tuberculosis in vitro contain mycobacterial components, including mannosylated lipoarabinomannan (ManLAM) and other mycobacterial lipids (14), and can activate macrophages and Ag-specific T cells in vitro and in vivo (15). However, these previous studies did not address the production of exosomes during an in vivo infection, the activity of these in vivo-derived exosomes, or whether exosomes could promote cellular recruitment. To address these questions, we defined the chemokine response and cell recruitment activity of noninfected macrophages after treatment with different exosome populations. We also isolated exosomes from mice infected with M. bovis bacillus Calmette-Guérin (BCG) and analyzed their biological activity, using a cytokine membrane array. Finally, we evaluated the exosome-treated macrophages for recruitment of cells in vivo, using a hollow fiber implantation model (16). The polyvinylidene fluoride (PVDF) hollow fiber allows for movement of soluble components but restricts cellular exchange between the inside and outside of the fiber. The hollow fiber can be removed and analyzed for cells attached to the external surface. We found that exosome concentration in serum correlated strongly with bacterial load in M. bovis BCG-infected mice and that these exosomes could stimulate macrophage chemokine production ex vivo. We also discovered that macrophages treated with exosomes released from infected cells are chemotactic for leukocytes both in vitro and in vivo. Our study suggests that exosomes released from infected cells during a mycobacterial infection could facilitate cellular recruitment as well as other immune functions. The University of Notre Dame is accredited through the Animal Welfare Assurance (#A3093-01). All animal studies were conducted according to the Institutional Animal Care and Use Committee guidelines. Bone marrow-derived macrophages (BMMs) were isolated from 6- to 8-wk-old female C57BL/6 mice and cultured in vitro, as previously described (17). The mouse macrophage cell line RAW264.7 was maintained in RPMI 1640 supplemented with 10% FBS, 10 mM sodium pyruvate, and 25 mM HEPES. M. tuberculosis H37Rv, M. smegmatis, and M. bovis BCG were each grown in Middlebrook 7H9 broth supplemented with oleic albumin dextrose catalase until midlogarithmic growth phase and frozen down as stocks in growth media plus 15% glycerol. Prior to use, the bacterial stocks were thawed and the mycobacteria were de-clumped by a brief sonication and passed through a syringe fitted with a 27-gauge needle at least 10 times. Confluent monolayers of RAW 264.7 mouse macrophage cell line (1.5 × 108 cells) were infected with M. tuberculosis or M. smegmatis or were left uninfected as controls. Before infection, the bacterial cultures were opsonized by incubation for 2 h with normal horse serum, and an uptake assay was undertaken to obtain ∼80% infectivity, as described (17). The RAW264.7 macrophages were infected with bacteria for 4 h, followed by washes with 1× PBS. The cells were cultured in RPMI 1640 containing exosome-free FBS (10% final concentration), and exosomes were isolated from the culture supernatants of infected and uninfected RAW 264.7 cells after 72 h and purified on linear sucrose gradient, as previously described (18). The exosomes formed a distinct ring based on their density (1.13 and 1.18 g/ml) and were carefully recovered from the gradient. In the absence of a distinct ring, gradient fractions 5, 6, and 7 were collected, pooled, and washed in PBS (1×). For some experiments, exosomes were purified using ExoQuick (System BioSciences, Mountain View, CA). On average, 20 μg purified exosomes were obtained from 10 million cells. C57BL/6 mice were infected retro-orbitally with M. bovis BCG (106 bacilli per mouse) or injected with an equal volume of PBS. Mice were sacrificed at different time points (four mice per group), and serum and spleens were collected. Exosomes were isolated from mouse serum by precipitating in ExoQuick solution overnight, according to the manufacturer’s instructions. Exosomes isolated from M. bovis BCG-infected or PBS-treated mice are referred to as BCG exosomes or PBS exosomes, respectively. Spleens from infected mice were homogenized and passed through a 70-μm cell strainer. The cell suspension was treated with RBC lysis buffer, followed by washes in 1× PBS. The suspension was serially diluted in PBS + Tween 80 (0.05% v/v) and plated on 7H10 agar supplemented with oleic albumin dextrose catalase. CFUs were determined after 4 wk. Primary bone marrow macrophages (1 × 106 cells) were stimulated with exosomes at 40 μg/ml (uninfected and Rv exosomes) or 500 μg/ml (BCG and PBS exosomes) for 16 h or were left untreated. The cell culture supernatants were harvested, and particulates were removed by centrifugation. The supernatants were tested immediately for cytokine/chemokine levels, using the Mouse Cytokine Array Panel A kit (R&D Systems, Minneapolis, MN) according to the manufacturer’s instructions. Briefly, cell culture supernatants were mixed with a blend of biotinylated detection Abs and incubated with the nitrocellulose membrane that contains 40 different anti-cytokine/chemokine capture Abs spotted in duplicate. Any cytokine/Ab complex formed is bound to the immobilized capture Ab. The membranes were incubated with chemiluminescent substrate (Thermo Scientific [Pierce], Rockford, IL) and exposed to x-ray film. In separate experiments, the cell culture supernatants were also tested for MIP-1α and RANTES levels by ELISA (Biosource, Camarillo, CA, and R&D Systems, respectively), per the manufacturer’s instructions. BMMs were seeded in the bottom chamber of the Transwell plate (Costar, Corning, NY; 8.0-μm pore size polycarbonate membrane filter) and stimulated with exosomes, as described previously (19). BMMs or splenocytes were labeled with 2.5 μM CFSE (Molecular Probes, Eugene, OR). The labeled cells were seeded in the top chamber of the Transwell and allowed to migrate for 2 h. The filters were rinsed with 1× PBS to remove unattached macrophages and placed on a slide mounted with a coverslip. Fluorescent macrophages that migrated to the bottom surface of the Transwell filter were counted in 10 randomly selected fields, using a Zeiss Observer fluorescent microscope, and the transmigration index was calculated as the ratio of migration in the presence of stimulation to migration in the absence of stimulation. Splenic cells that migrated to the bottom chamber of the Transwell plate were counted on a hemacytometer and stained for flow cytometry analysis. The cells were rinsed with Dulbecco’s PBS and gently scraped and counted on a hemacytometer, using trypan blue to assess viability. The cells were washed in FACS buffer and blocked with 10% mouse serum and stained with PE-conjugated anti-mouse Ly6G/6E (BD Pharmingen, San Diego, CA), FITC-conjugated F4/80 (eBiosciences, San Diego, CA), PE-Cy5–conjugated anti-mouse TCR β (BD Pharmingen, San Diego, CA), or PE-conjugated CD11b (BD Pharmingen), using isotype Abs as controls. Cells were analyzed for protein surface expression with a Beckman Coulter flow cytometer, and the percentage of positive cells was calculated. Exosomes were resuspended in 150 mM ammonium biocarbonate buffer, and 10 μl was loaded onto a carbon-Formvar–coated copper grid. The sample was left on the grid for 5 min to form a monolayer, and the remaining sample was wiped off using a clean filter paper. The grids were allowed to dry at room temperature. The sample was stained with 5 μl 2% filtered uranyl acetate solution for 2 min and dried. The grids were loaded onto a TITAN 80-300 Scanning Transmission Electron Microscope with an accelerating voltage set to 80 kV, and images were taken with Fei’s Tecnai software. The exosomes were also characterized for size distribution and quantitated by NanoSight LM10, using light scatter from the 635-nm red laser, as well as NTA 2.2 Analytical software. Exosomes (40 μg) were resuspended in radioimmunoprecipitation assay buffer (25 mM Tris-HCl, pH 7.6; 150 mM NaCl;1% Nonidet P-40; 1% sodium deoxycholate; and 0.1% SDS) with protease inhibitors. The suspension was mixed with Laemmli buffer, heated at 95ºC for 5 min, and chilled on ice for 5 min before loading onto SDS gel. Rabbit anti-human CD63 and CD9 Abs (System Biosciences) were used as primary Abs, and goat anti-Rabbit IgG HRP was used as the secondary Ab. Cellular recruitment was studied in 6- to 8-wk-old female hairless, immunocompetent SKH1 mice obtained from Charles River Laboratories (Wilmington, MA) and further bred in the Freiman Animal Facility. BMMs were left untreated or were treated with exosomes or infected with M. bovis BCG for 16 h, and the cell suspension was placed in the lumen of PVDF hollow fibers (molecular mass cutoff, 500 kDa; Spectrum Laboratories, Rancho Dominguez, CA). The hollow fibers were heat sealed at both ends with a final length of ∼2 cm (16). A small incision was made in the SKH1 mice on the dorsal surface beneath the neck, and two fibers were implanted s.c. into the mouse, one fiber on each side of the body cavity. The incision in the skin was sealed using LiquiVet tissue adhesive, and lidocaine was applied at the site of the incision. The fibers were recovered from mice after 16 d and resuspended in 10% formalin solution for histological studies or in 1× Dulbecco’s PBS + 10 mM EDTA, followed by vortexing to detach the cells for flow cytometry. To study cellular recruitment in lungs, C57BL6 mice (four or five mice per group) were treated intranasally with PBS, 25 μg exosomes in PBS, or were infected intranasally with M. bovis BCG at 1 × 106 CFU per mouse. After 5 d, mice were sacrificed and lungs from four or five mice per group were pooled. Total lung cells were treated with collagenase for 2 h, followed by treatment with ACK lysis buffer (150 mM NH4Cl, 1 mM KHCO3, and 0.1 mM EDTA) to lyse RBCs. Cells were stained with FITC-conjugated anti-mouse F4/80, PE-conjugated anti-mouse CD11b, or PE-conjugated anti-mouse Ly6G, using isotype-matched Abs as background control. The fibers were fixed in 10% neutral buffered formalin overnight and then transferred to 70% ethyl alcohol. The samples were processed using a Shandon Citadell 2000 automated tissue processor. After fixation, samples were dehydrated, embedded in paraffin, and sectioned at 4 μm, using a Leica RM 2155 automated microtome. Sections were stained with H&E to examine general tissue and cellular morphological characteristics. Data were analyzed by a one-tailed or paired Student t test. Statistical significance was assumed at p ≤ 0.05. Purifying exosomes from mouse serum and other sources by sucrose gradient is cumbersome and time consuming, with relatively low yield (20–40%). Therefore, alternative purification methods are needed. ExoQuick, which uses a proprietary precipitation technique to purify exosomes from serum, media, and other sources, has been shown to give exosomes of high enough quality for functional and RNA/protein characterization studies (www.systembio.com/exoquick) (20). Therefore, we evaluated ExoQuick-purified vesicles for size and shape, using transmission electron microscopy (TEM). As shown in Fig. 1A, the purified vesicles were of the expected size of exosomes (50–100 nm by TEM) and appeared to have minimal vesicles outside this size range. To look more carefully at the size distribution of the ExoQuick-purified exosomes and to compare this with the “gold standard” sucrose gradient-purified exosomes, we evaluated the exosomes using a NanoSight LM10, which allows for determination of vesicle size between 30 and 1000 nm. As shown in Fig. 1B, no clear difference was evident in the vesicle size distribution between the ExoQuick- and sucrose gradient-purified exosomes. Of interest, the mean size for exosomes using this instrument, which tracks the movement of a particle and calculates its size based on Brownian motion, was 128 nm and 144 nm for the ExoQuick- and sucrose gradient-purified exosomes, respectively. These values are larger than what is calculated from the TEM, indicating that how exosomes are processed or observed will affect the size measurement. Finally, we observed that exosomes purified from M. smegmatis-infected RAW 264.7 cells by ExoQuick or sucrose gradient showed similar ability to stimulate TNF-α production when added to mouse bone marrow-derived macrophages (Fig. 1C). However, ExoQuick may precipitate other vesicle populations or protein aggregates that we could not detect with the present methods. 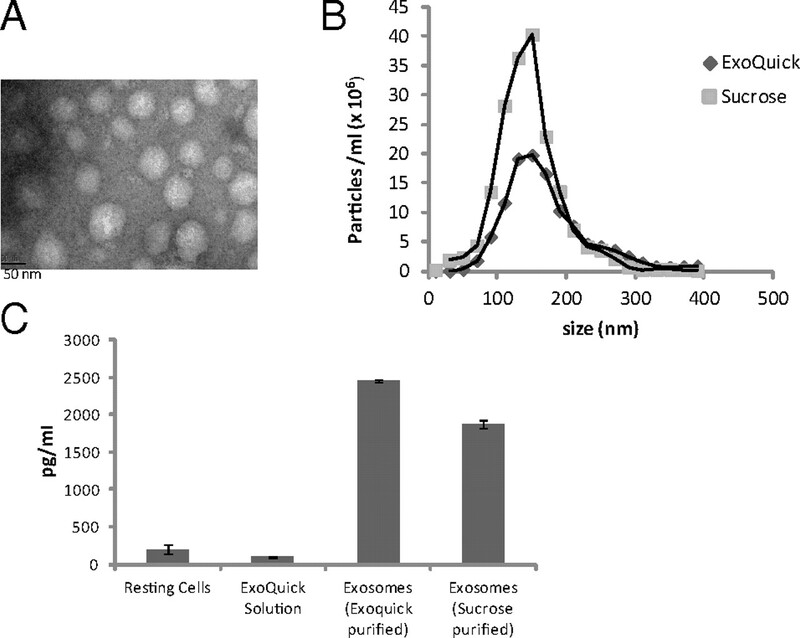 Comparison of exosomes purified on a linear sucrose gradient versus ExoQuick. Exosomes were isolated from cell culture supernatants of M. smegmatis-infected or uninfected RAW264.7 macrophages. Exosomes were purified using the ExoQuick precipitation solution or on a linear sucrose gradient (0.25 M–2.5 M). (A) The exosomes were characterized morphologically by TEM. (B) The exosomes were characterized for size distribution and quantitated by NanoSight LM10, using light scatter from the 635-nm red laser. (C) RAW264.7 macrophages were seeded in a six-well plate and were left untreated or treated with exosomes at 40 μg/ml for 16 h. The cell culture supernatants were tested for TNF-α levels by ELISA. Exosomes were purified from cell culture supernatants of M. tuberculosis-infected or uninfected RAW 264.7 cells. BMMs were treated with exosomes at 40 μg/ml (equivalent to ∼2.3 × 1010 exosomes per milliliter, based on NanoSight LM10 measurements) for 16 h or left untreated, and the cell culture supernatants were harvested. Supernatants were assayed for cytokine/chemokine levels, using a mouse cytokine array kit (Fig. 2A). Pixel densities for the different array proteins from three experiments were defined and plotted (Fig. 2B). Resting bone marrow macrophages released measurable levels of TIMP1, CXCL1, M-CSF, CCL2, MIP-2, IP-10, and IL-1ra. Treatment of macrophages with exosomes derived from uninfected RAW 264.7 cells ( uninfected exosomes) induced higher expression of sICAM1, IL-1ra, and MIP-2 in comparison with resting cells (RCs). However, treatment of macrophages with exosomes released from M. tuberculosis-infected cells (Rv exosomes) induced not only measurable levels of TNF-α, MCP-5, MIP-1α, MIP-1β, RANTES, and G-CSF but also relatively higher levels of sICAM-1, MIP-2, and IL-1ra, compared with resting macrophages or those treated with uninfected exosomes. For a complete list of Abs spotted on the array, see Supplemental Table I.
Macrophages treated with exosomes released from mycobacteria-infected cells secrete cytokines and chemokines. Exosomes from M. tuberculosis-infected, M. smegmatis-infected, or uninfected RAW264.7 macrophages were purified by ExoQuick and used to treat BMMs at 40 μg/ml for 16 h. The supernatants were harvested and assayed for immune proteins, using mouse cytokine arrays. Cytokine arrays were compared between untreated BMMs and those treated with exosomes from uninfected or H37Rv-infected cells (A) or between BMMs treated with exosomes from M. smegmatis- or H37Rv-infected cells (C). The pixel densities for each spot were calculated using ImageJ software and plotted. Results are the mean of three separate experiments + SD. *Indicates statistical difference when compared with untreated cells/RCs (B) or Rv exosome-treated cells (D) (p ≤ 0.05). The results obtained in Ab array analysis for Rv exosomes were confirmed for RANTES (E) and MIP-1α (F) by ELISA, and the results are the mean of three separate experiments, including SD. *Indicates statistical difference when compared with untreated cells/RCs (p ≤ 0.05). (A1,A2), (F1,F2), and (A23,A24) correspond to reference numbers for cytokine array (see Supplemental Table I for arrangement of Abs on the array). An interesting finding is that although exosomes released from M. tuberculosis-infected macrophages induced chemokine/cytokine production, the exosomes from cells infected with M. smegmatis, a nonpathogenic mycobacterium, induced a much more robust macrophage response (Fig. 2C, 2D). Previous studies by our group and others indicated that infection with nonpathogenic mycobacteria induces macrophage activation to a greater extent than does infection with pathogenic mycobacteria (17, 21). This ability to induce a more robust macrophage response seems to extend to the exosomes released from cells infected with nonpathogenic compared with pathogenic mycobacteria and likely is due to differences in the mycobacterial components retained in or on the exosomes. RANTES and MIP-1α are among the C-C chemokines known to induce the migration of monocytes and lymphocytes (22), and we confirmed their elevated expression in macrophages treated with exosomes released from H37Rv-infected RAW 264.7 cells (Fig. 2E, 2F). Because these chemokines were released from macrophages treated with Rv exosomes, we tested whether the treated macrophages could stimulate transmigration of macrophages, using an in vitro Transwell system. BMMs seeded in the bottom chamber of a Transwell plate were treated with sucrose gradient-purified exosomes for 16 h. CFSE-labeled BMMs were added to the upper chamber and allowed to migrate for 2 h. As shown in Fig. 3A, we observed more CFSE-labeled macrophages that had migrated through the Transwell filter when these cells were exposed to Rv exosomes than was the case with untreated BMMs or those treated with uninfected exosomes. The number of labeled macrophages that migrated to the bottom of the Transwell filter was quantified by counting 10 random fields for each treatment group (Fig. 3B). Exosomes from H37Rv-infected cells induce transmigration of CFSE-labeled BMMs. BMMs seeded in the bottom chamber of a six-well Transwell plate were left untreated or treated with sucrose gradient-purified exosomes at 40 μg/ml for 16 h. CSFE-labeled BMMs were added to the upper chamber and allowed to migrate for 2 h. (A) Fluorescent cells that migrated to the bottom of the filter were visualized by fluorescent microscopy (original magnification ×20). (B) Cells in 10 random fields were counted, and the transmigration index was calculated as a ratio of migration in the presence and absence of exosome stimulation. Results are the mean of three separate experiments + SD. *Indicates statistical difference when compared with untreated cells/RCs. p ≤ 0.05. Bronchoalveolar lavage (BAL) fluid isolated from TB patients shows increased levels of chemokines, including RANTES (23). The production of these chemokines is required for the proper trafficking of leukocytes during the course of an M. tuberculosis infection (24). We tested splenocytes isolated from M. bovis BCG-sensitized mice for migratory activity following exposure to exosome-treated or untreated BMMs. Splenocytes isolated from mice 5 wk postinfection were labeled with CSFE and added to the top chamber of a Transwell plate. The bottom chambers contained BMMs that were stimulated with sucrose-purified exosomes or were left untreated. Splenic macrophages that migrated to the bottom surface of the Transwell filter were counted in 10 randomly selected fields. As shown in Fig. 4A, more splenic macrophages migrated through the filter when cells were exposed to BMMs treated with Rv exosomes than when they were exposed to BMMs treated with exosomes from uninfected cells. Splenic cells that migrated into the bottom chamber of the Transwell plate were also quantified and again were higher in wells containing Rv exosome-treated BMMs (Fig. 4B). To look at the cell populations, flow cytometry was performed using PE-conjugated Ly6G/6E and Cy5-conjugated TCRβ Abs. 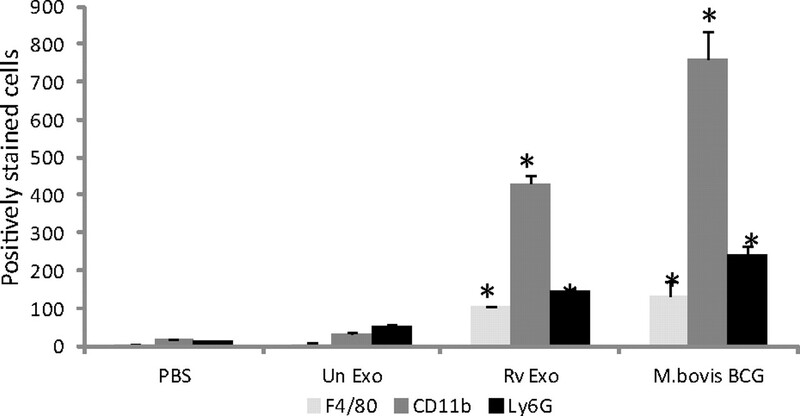 Macrophages treated with Rv exosomes, compared with untreated cells, significantly enhanced transmigration of neutrophils (Fig. 4C) and T cells (Fig. 4D). Of interest, splenocytes isolated from uninfected mice also showed increased migratory activity upon exposure to Rv exosome-treated BMMs, suggesting that migratory activity is not dependent upon prior activation following infection (data not shown). 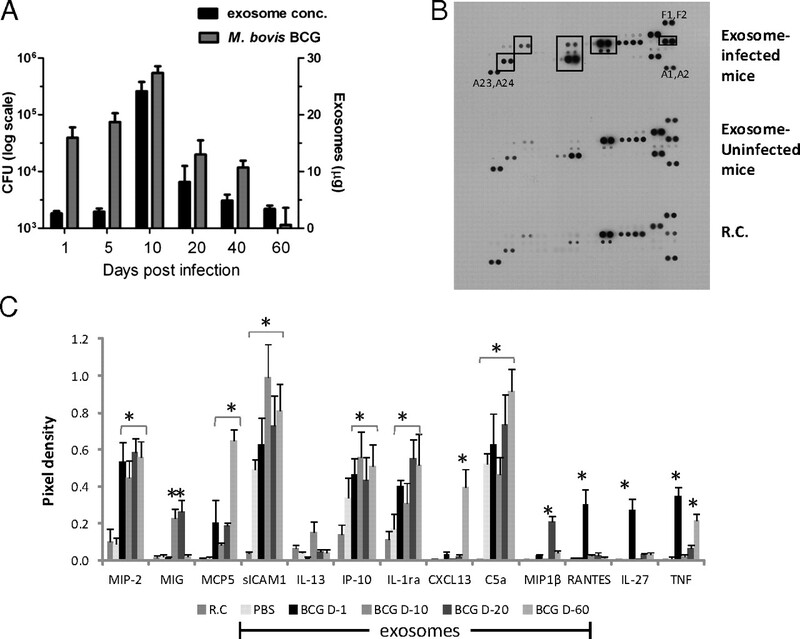 Exosomes from H37Rv-infected macrophages induce transmigration of M. bovis BCG-sensitized splenocytes. Splenocytes were isolated from mice 5 wk after an infection with 1 × 106 CFU M. bovis BCG. BMMs were seeded in the lower chamber of a Transwell plate and stimulated with sucrose gradient-purified exosomes at 40 μg/ml for 16 h. CFSE-labeled splenocytes were added to the top chamber of the Transwell plate, and cells were allowed to migrate for 2 h. (A) Splenic macrophages that migrated to the bottom of the filters were counted in 10 random fields, and results are represented as the transmigration index. (B) Cells that migrated to the bottom chamber were collected and counted on a hemacytometer. Additional cells were stained with PE-conjugated Ly6G (C) or Cy5-conjugated TCR-β (D) to characterize the neutrophils and T cells, respectively, and then analyzed by flow cytometry. Results are the mean of two separate experiments + SD. *Indicates statistical difference when compared with untreated cells/RCs. p ≤ 0.05. The initial experiments defined the chemotactic activity of exosomes isolated from cultured infected macrophages. To begin evaluating exosome production during the course of an in vivo infection, we isolated serum from M. bovis BCG-infected or naive mice at different times postinfection and purified the exosomes, using ExoQuick. To confirm that the vesicles purified by ExoQuick were primarily exosomes, samples isolated from day 10 infection were analyzed by TEM, NanoSight, and Western blot. As shown in Fig. 5A, the purified vesicles observed by TEM had the expected size and shape of exosomes. The size distribution of the particles observed on the NanoSight LM10 further supports the finding that the majority of vesicles were exosomes (Fig. 5B). Finally, the vesicles expressed the host exosomal markers CD63 and CD9 (Fig. 5C). Isolation of exosomes from M. bovis BCG-infected mice. C57BL/6 mice were infected with 1 × 106 CFU of M. bovis BCG or were injected with PBS as control. Exosomes were isolated from mouse serum, using ExoQuick, and were quantified by bicinchoninic acid. The exosomes were characterized morphologically by TEM (A) or by NanoSight (B). The exosome pellet resuspended in radioimmunoprecipitation assay buffer was loaded on SDS-PAGE gel and probed for exosome markers CD63 and CD9 (C). As seen in Fig. 6A, the kinetics of bacterial load showed an initial increase that peaked at day 10, followed by a gradual decline through day 60. Of interest, the exosome concentration showed similar kinetics, suggesting that infection induces exosome secretion correlating with bacterial burden. We subsequently tested whether exosomes from the serum of infected mice could promote a macrophage response ex vivo. We used exosomes isolated at different times postinfection. BMMs were treated with the serum-derived exosomes or were left untreated for 16 h. Cell culture supernatants were harvested and assayed for cytokine/chemokine levels, using the mouse cytokine array kit (Fig. 6B). Exposure of macrophages to exosomes from uninfected mice induced significantly higher expression of sICAM1 and C5a than was the case with RCs alone. Treating macrophages with exosomes from infected mice resulted in significantly higher levels of MIP-2, MIG, MCP5, sICAM-1, IP-10, IL-1ra, CXCL13, C5a, MIP1β, RANTES, IL-27, and TNF-α, compared with levels in RCs (Fig. 6C). However, the expression profiles differed between treatments, with exosomes isolated at different time points postinfection. For example, CXCL13 expression was only significantly higher using exosomes isolated at day 60. RANTES, TNF-α, and IL-27 levels were only significantly higher using exosomes isolated at day 1. Some cytokines, such as MIP-2, showed higher expression using exosomes isolated at any time point (Fig. 6C). Exosome production in M. bovis BCG-infected mice correlates with bacterial load and shows proinflammatory activity. (A) C57BL/6 mice infected with 106 CFU M. bovis BCG were sacrificed at various time points, and serum exosome concentration and CFU were determined. Results are representative of three independent experiments, each with four mice per group. BMMs were treated for 18 h with 500 μg/ml of serum-derived exosomes isolated at days 1, 10, 20, and 60 (D-1 through D-60) post-M. bovis BCG infection or with exosomes from PBS-treated control mice. The culture supernatants of the treated BMMs were analyzed for cytokines and chemokines, using mouse cytokine arrays according to the manufacturer’s instructions. (B) Shown is the array using exosomes from day 10 infected mice. (C) The pixel densities for each spot were calculated using ImageJ software and plotted. Results are representative of three independent experiments + SD. *Indicates statistical difference when compared with untreated cells/RCs (p ≤ 0.05). (A1,A2), (F1,F2), and (A23,A24) correspond to reference numbers for cytokine array (see Supplemental Table I for arrangement of Abs on the array). To define whether exosomes can also recruit myeloid cells into the lungs, we intranasally administered ExoQuick-purified exosomes into mice and harvested the lung tissue 5 d posttreatment. As shown in Fig. 7, the lungs of mice treated with Rv exosomes or infected with M. bovis BCG had a significantly higher number of CD11b+ cells than did the lungs of mice treated with PBS or uninfected exosomes. A moderate increase in the number of F4/80+ and Ly6G+ cells (macrophages and neutrophils, respectively) also occurred in BCG-infected or Rv exosome-treated mice. Intranasal administration of Rv exosomes in C57BL/6 mice induces cellular recruitment in lungs. C57BL/6 mice were intranasally administered PBS or 25 μg of exosomes in PBS or infected with 1 × 106 CFU M. bovis BCG. Mice were sacrificed at day 5, and lungs from four mice per group were pooled. Total lung cells were treated with collagenase for 2 h, and cells were stained with FITC-conjugated anti-mouse F4/80, PE-conjugated anti-mouse CD11b, PE-conjugated anti-mouse Ly6G, or isotype controls. Plotted is the number of cells that stained positive for the given markers. Results are representative of two independent experiments + SD. *Indicates statistical difference when compared with PBS control. p ≤ 0.05. To study the effect of macrophages exposed to exosomes on inducing migration and recruitment of host immune cells in vivo, untreated, exosome-treated, or M. bovis BCG-infected BMMs were removed from plates, and the cells were added to preconditioned PVDF hollow fibers. The sealed hollow fibers were implanted s.c. in immunocompetent SKH1 mice (Fig. 8A). The fibers have a 500-kDa molecular mass cutoff, which allows diffusion of soluble factors but prevents entry of host cells into the fibers. Fibers were recovered from mice after 16 d and assessed for cell recruitment by histologic examination and flow cytometry. H&E staining showed increased cellular infiltration around the hollow fibers when these were filled with BMMs treated with Rv exosomes, compared with untreated BMMs or cells treated with exosomes from uninfected cells (Fig. 8B). This observation suggests that macrophages treated with Rv exosomes secrete chemokines that diffuse from the hollow fibers and lead to enhanced recruitment of host immune cells. A similar recruitment of cells was observed when hollow fibers were filled with M. bovis BCG-infected BMMs (Fig. 8B). 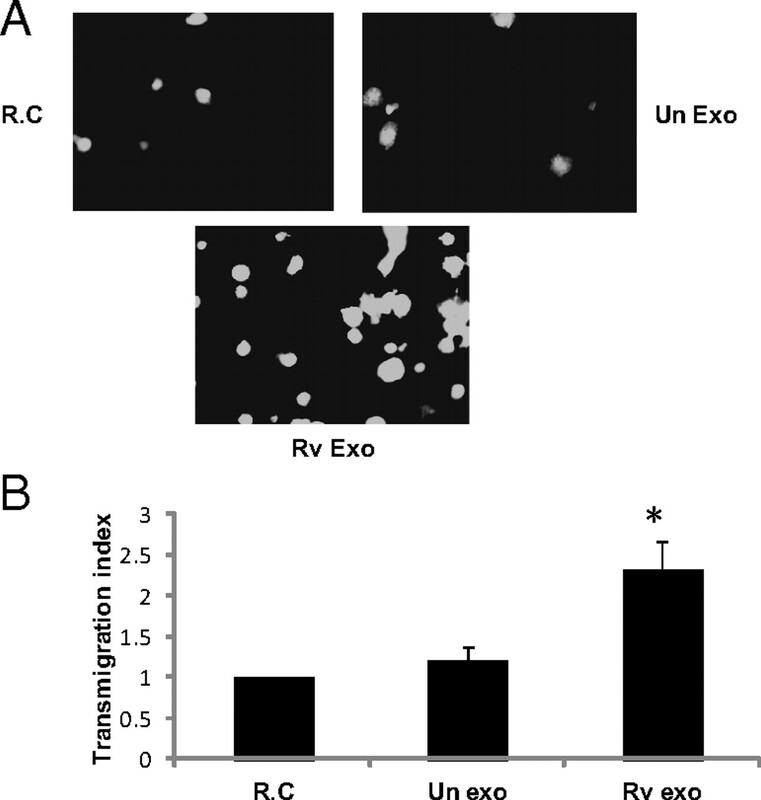 Macrophages treated with Rv exosomes can induce cell recruitment in vivo. 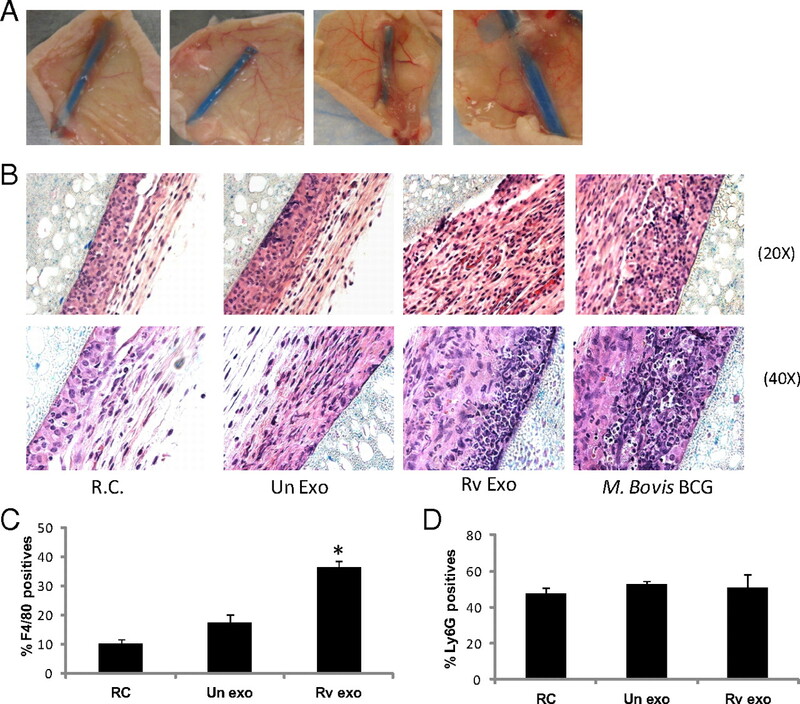 (A) BMMs stimulated with exosomes, infected with M. bovis BCG, or left untreated were gently removed from plates and added into the lumen of PVDF hollow fibers, which were sealed at both ends. The fibers were then implanted s.c. into SKHI mice and recovered after 16 d. (B) The fibers were fixed in 10% formalin solution, and perifiber tissue was stained with H&E. Original magnifications ×20 and ×40. Results are representative of three independent experiments, each with four mice per group. In a separate group of four mice, cells were removed from the fibers and stained for macrophages and neutrophils, using FITC-conjugated F4/80 (C) and PE-conjugated Ly6G (D), respectively, and analyzed by flow cytometry. Results are the mean of three separate experiments + SD. *Indicates statistical difference when compared with untreated cells/RCs. p ≤ 0.05. To define the cell populations recruited to the hollow fibers, cells were removed from the fibers, Ab stained, and analyzed by flow cytometry. As shown in Fig. 8C, recruitment of macrophages to the hollow fibers was enhanced when these were filled with BMMs treated with Rv exosomes, but not with cells treated with exosomes from uninfected cells. However, no significant differences were observed in neutrophil recruitment between the fibers filled with exosome-treated and those filled with untreated BMMs (Fig. 8D). M. tuberculosis is an intramacrophage pathogen. Macrophages provide not only the primary niche for bacterial survival and replication but also a mechanism for control through T cell-mediated activation of uninfected macrophages. Following infection, mycobacteria are phagocytosed by alveolar macrophages in the lung and subsequently colonize the underlying epithelial layer, inducing an inflammatory response. This response triggers recruitment of mononuclear cells from neighboring blood vessels as a reservoir of host cells for multiplying bacteria and the initiation of granuloma formation (25). As recruited macrophages differentiate into multinucleated giant cells, foamy macrophages, and epithelioid macrophages, the phase of rapid bacterial multiplication is followed by a “containment” state characterized by active lymphocyte recruitment (26). However, it is not clear whether chemokine production by infected macrophages are the only mediators of cellular recruitment because previous in vitro studies indicate that M. tuberculosis-infected macrophages show limited production of proinflammatory molecules relative to cells infected with less pathogenic mycobacteria (17, 21). Other contributors to the cellular recruitment process may include M. tuberculosis cell wall components, which are known to be released into the extracellular milieu (27, 28). Coupling some of these mycobacterial components onto beads induced cellular accumulation characteristic of granuloma formation in mice (8). With a human granuloma model, it was found that lipoarabinomannan and oxygenated mycolic acids induce human macrophages to differentiate into multinucleated giant cells and foamy macrophages, respectively (29). Interestingly, M. tuberculosis within these foamy macrophages shows differential trafficking and appears to be in a dormant, nonreplicative state; therefore, these mycobacteria could serve as the bacterial reservoir during latency (30). Moreover, foamy macrophages may play a critical role in disease transmission, as the death of these cells through necrosis results in the release of cholesterol and other lipids within the granuloma, promoting caseation (29, 30). However, these previous studies with mycobacterial lipids have used artificial experimental systems (e.g., coating lipids on beads), and it has not been shown that granuloma formation can be promoted by mycobacterial components under more physiological conditions. We hypothesized that exosomes could function in vivo to transport mycobacterial lipids and proteins to the extracellular environment and promote granuloma formation. Exosomes are 30- to 100-nm microvesicles that are known to primarily function in intercellular communication (31). They are present in various body fluids, including blood, BAL fluid, breast milk, and urine, indicating that they may function both locally and systemically (32, 33). Their presence in tissue has been observed in electronic microscopic studies using a sheep ileal Peyer’s patch model, in which it was shown that epithelial cells release 50-nm particles from their apical surface (34). Although the presence of exosomes in granulomas has not been observed directly, we have isolated exosomes containing mycobacterial components from the BAL fluid of M. tuberculosis-infected mice, suggesting their release from infected macrophages within the granuloma (35). In recent studies, Qazi et al. (36) observed that patients with sarcoidosis, a granulomatous disease of the lung, secrete more exosomes into the BAL fluid, compared with healthy controls, and these exosomes had increased expression of MHC class I and II, CD9, CD63, and CD81, as well as increased proinflammatory activity. Previous studies in our laboratory have demonstrated that exosomes released from M. tuberculosis-infected cells can induce a proinflammatory response when exposed to naive macrophages (37), as well as suppress macrophage responses to IFN-γ (19). These exosomes contain mycobacterial components, including >40 mycobacterial proteins as well as glycolipids such as ManLAM (38), and can activate Ag-specific CD4+ and CD8+ T cell responses in vitro and in vivo (15). Recently, it has been shown that mycobacteria also release active membrane vesicles that may provide a mechanism for incorporation of mycobacterial components into exosomes (39). Because exosomes released from M. tuberculosis-infected cells can induce physiological changes in neighboring cells, we were interested in evaluating their ability to recruit cells that drive granuloma formation. Unfortunately, at present it is difficult to define the contribution of exosomes to granuloma formation and infection control, compared with the role of cytokines and chemokines produced by infected macrophages, because both are present during an in vivo infection. The most straightforward approach would be to use mice deficient in exosome production for the infection experiments. However, the cellular components involved in exosome biogenesis remain unknown. The few published studies have highlighted the role of Rab27a, Rab35, and other Rab proteins (40, 41). However, these proteins are involved in many vesicular transport processes, and the effect of modulating their expression would not be limited to exosome biogenesis. Therefore, we required the physical separation of exosomes from the infected macrophages for both in vitro and in vivo experiments. Our initial experiments focused on whether exosomes stimulated chemokine production because chemotactic factors play a key role in cellular recruitment and granuloma formation upon M. tuberculosis infection. We found that exposure of BMMs to exosomes released from infected cells, but not from uninfected cells, results in increased levels of various chemokines, including RANTES and MIP-1α. This observation supports our general findings that exosomes released from M. tuberculosis-infected cells can promote a proinflammatory response in naive macrophages (37). To determine if this chemokine production can promote cell migration, we used a Transwell system with exosome-treated BMMs in the bottom chamber and CSFE-labeled macrophages in the top. These experiments reveal that exosomes released from M. tuberculosis-infected macrophages can promote macrophage chemotaxis. We also observed that the activity of exosomes in promoting cell migration was not limited to macrophages, as T cells present within splenocytes also showed marked migration when exposed to exosome-treated macrophages. Recent studies by Esser et al. (42) indicated that exosomes from human APCs contain enzymes for leukotriene biosynthesis and can promote granulocyte migration and recruitment. At present, only limited studies defining exosome production during the course of an in vivo infection have been done. These have shown that exosomes released from HSV- or EBV-infected cells can modulate the activity of uninfected cells through the transfer of signaling molecules and functional microRNAs (43). In the current study, we isolated exosomes from the serum of M. bovis BCG-infected mice and analyzed the exosomes for biological activity ex vivo. We found that exosome concentration tightly correlated with bacterial load, suggesting that the presence of mycobacteria was driving the exosome production. We do not yet know the cellular source of the exosomes, but it likely involves infected as well as uninfected cells. 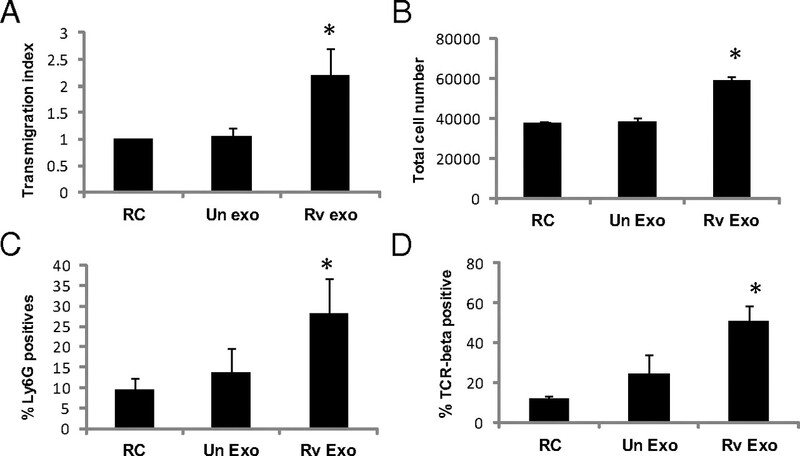 From the cytokine array, it is clear that exosomes isolated from infected mice induce a different macrophage response compared with exosomes from uninfected mice. However, RANTES, MIP-2, and TNF-α expression was also elevated in macrophages treated with exosomes from M. tuberculosis-infected cells, suggesting some commonality between in vitro- and in vivo-derived exosomes. Of note, the exosomes isolated at different times postinfection induced different responses when incubated with macrophages ex vivo, suggesting that the exosomes change in composition during the course of an infection. How exosome composition changes in the context of both host and mycobacterial components awaits future investigation. It is important to note that although our TEM and Nanosight data suggest that the vesicle population we isolated from serum by ExoQuick primarily had the size expected of exosomes, it is likely that other types of vesicles are also present in our preparation. ExoQuick purification is not specific for exosomes, but it does allow for purification of vesicles from small volumes of serum. Further, although our previous experiments indicated that cultured macrophages infected with M. bovis BCG do not release annexin V-stained vesicles (37), it is still possible that some vesicles released from our infected cells are not derived from fusion of the multivesicular body. These differences in purification procedures may also account for the differences in mean vesicle size observed between ExoQuick purified and sucrose-purified samples. To determine whether exosomes can induce cellular recruitment in vivo, we intranasally administered exosomes into the lung and measured cellular recruitment. However, this technique, although informative—because it measures the ability of exosomes to recruit cells into the lung—does not directly address whether exosome-treated macrophages may promote granuloma formation. To address this question, we used the hollow fiber implantation technique, which has been used previously to evaluate granuloma formation in vivo (16, 44). The semidiffusible PVDF hollow fibers allow diffusion of small soluble molecules, including chemotactic factors, but prevent traffic of host immune cells across the fibers, thus facilitating the analysis of recruited cells in the perifiber area in vivo. The lumens of hollow fibers were filled with untreated, exosome-treated, or M. bovis BCG-infected macrophages and implanted s.c. into mice. We chose 16 d for isolation of hollow fibers, to provide sufficient time for macrophage-induced cellular recruitment and to minimize foreign body inflammation associated with fiber implantation. Moreover, we were able to observe live macrophages within the hollow fibers after removal from the mice 16 d postimplantation (data not shown). Our results indicate that macrophages that are treated with exosomes containing mycobacterial components can promote macrophage recruitment in vivo. The general distribution of macrophages onto the hollow fibers suggests no specific foci along the membrane, which is expected because the macrophages and the chemokines would be uniformly distributed within the fiber. Our flow cytometry data support our histological findings. Although neutrophils were present in the perifiber tissue, we did not observe any significant difference in recruitment of neutrophils between the different treatment groups. This finding suggests that the neutrophil recruitment may be more associated with the tissue injury induced by the fiber implantation than with BMM-induced recruitment. In summary, our data support a role for exosomes in promoting macrophage release of chemotactic factors and in macrophage recruitment both in vitro and in vivo. What mycobacterial and/or host components are responsible for this activity await further investigation but likely involve lipids such as ManLAM, phosphatidylinositol mannoside, and trehalose dimycolate, which have been shown individually to promote granuloma formation (9). Moreover, additional studies are needed to elucidate the role of exosomes in controlling M. tuberculosis infection, but such studies require a better understanding of exosome biogenesis and the availability of new methodology to specifically block their production. We thank Sarah Chapman, Michael Pinn, and L.G. Klinkenberg for excellent technical assistance. This work was supported by the National Institutes of Health, National Institute of Allergy and Infectious Diseases Grant AI052439.
. 2010. Global tuberculosis control: WHO Report 2010. WHO, Geneva. 2004. Immunology of tuberculosis and implications in vaccine development. Tuberculosis (Edinb.) 84: 93–101.
. 2010. Tuberculosis: what we don’t know can, and does, hurt us. Science 328: 852–856.
. 2009. Who benefits from granulomas, mycobacteria or host? Cell 136: 17–19. 2011. Mycobacterium tuberculosis and the intimate discourse of a chronic infection. Immunol. Rev. 240: 252–268.
. 2009. The spectrum of latent tuberculosis: rethinking the biology and intervention strategies. Nat. Rev. Microbiol. 7: 845–855.
. 2001. Immunology of tuberculosis. Annu. Rev. Immunol. 19: 93–129.
. 2005. Cell wall lipids from Mycobacterium bovis BCG are inflammatory when inoculated within a gel matrix: characterization of a new model of the granulomatous response to mycobacterial components. Tuberculosis (Edinb.) 85: 159–176.
. 2005. In vivo activity of released cell wall lipids of Mycobacterium bovis bacillus Calmette-Guérin is due principally to trehalose mycolates. J. Immunol. 174: 5007–5015.
. 1987. Vesicle formation during reticulocyte maturation. Association of plasma membrane activities with released vesicles (exosomes). J. Biol. Chem. 262: 9412–9420.
. 1998. Eradication of established murine tumors using a novel cell-free vaccine: dendritic cell-derived exosomes. Nat. Med. 4: 594–600.
. 2003. Presentation of donor major histocompatibility complex antigens by bone marrow dendritic cell-derived exosomes modulates allograft rejection. Transplantation 76: 1503–1510.
. 2008. Exosome function: from tumor immunology to pathogen biology. Traffic 9: 871–881.
. 2008. Exosomes derived from M. Bovis BCG infected macrophages activate antigen-specific CD4+ and CD8+ T cells in vitro and in vivo. PLoS ONE 3: e2461.
. 2004. Dormancy phenotype displayed by extracellular Mycobacterium tuberculosis within artificial granulomas in mice. J. Exp. Med. 200: 647–657.
. 2002. Differential regulation of the mitogen-activated protein kinases by pathogenic and nonpathogenic mycobacteria. Infect. Immun. 70: 3040–3052.
. 2007. Exosomes released from infected macrophages contain Mycobacterium avium glycopeptidolipids and are proinflammatory. J. Biol. Chem. 282: 25779–25789.
. 2011. Exosomes released from M. tuberculosis infected cells can suppress IFN-γ mediated activation of naïve macrophages. PLoS ONE 6: e18564.
. 2011. Exosome isolation for proteomic analyses and RNA profiling. Methods Mol. Biol. 728: 235–246.
. 2000. Secretion of cytokines by human macrophages upon infection by pathogenic and non-pathogenic mycobacteria. Microb. Pathog. 28: 313–318.
. 2003. Chemokines and tuberculosis. Cytokine Growth Factor Rev. 14: 467–477.
. 1997. Elevated chemokine levels in bronchoalveolar lavage fluid of tuberculosis patients. Am. J. Respir. Crit. Care Med. 155: 1474–1477.
. 1998. Chemokines induced by infection of mononuclear phagocytes with mycobacteria and present in lung alveoli during active pulmonary tuberculosis. Am. J. Respir. Cell Mol. Biol. 19: 513–521.
. 2011. Macrophages and control of granulomatous inflammation in tuberculosis. Mucosal Immunol. 4: 271–278.
. 2006. New insights into the function of granulomas in human tuberculosis. J. Pathol. 208: 261–269.
. 2001. Mycobacterial surface moieties are released from infected macrophages by a constitutive exocytic event. Eur. J. Cell Biol. 80: 31–40.
. 2000. Trafficking and release of mycobacterial lipids from infected macrophages. Traffic 1: 235–247.
. 2008. Foamy macrophages from tuberculous patients’ granulomas constitute a nutrient-rich reservoir for M. tuberculosis persistence. PLoS Pathog. 4: e1000204.
. 2009. Foamy macrophages and the progression of the human tuberculosis granuloma. Nat. Immunol. 10: 943–948.
. 2009. Exosomes—vesicular carriers for intercellular communication. Curr. Opin. Cell Biol. 21: 575–581.
. 2010. Nucleic acids within urinary exosomes/microvesicles are potential biomarkers for renal disease. Kidney Int. 78: 191–199. 1987. The follicle-associated epithelium of the ileal Peyer’s patch in ruminants is distinguished by its shedding of 50 nm particles. Immunol. Cell Biol. 65: 251–261.
. 2012. Tuberculosis biomarkers: prospects from the bench to the clinic. In Understanding Tuberculosis—Global Experiences and Innovative Approaches to the Diagnosis. Cardona P.-J., ed. InTech, Rijeka, Croatia.
. 2010. Proinflammatory exosomes in bronchoalveolar lavage fluid of patients with sarcoidosis. Thorax 65: 1016–1024.
. 2007. Exosomes released from macrophages infected with intracellular pathogens stimulate a proinflammatory response in vitro and in vivo. Blood 110: 3234–3244.
. 2010. Proteomic analysis identifies highly antigenic proteins in exosomes from M. tuberculosis-infected and culture filtrate protein-treated macrophages. Proteomics 10: 3190–3202.
. 2011. Mycobacteria release active membrane vesicles that modulate immune responses in a TLR2-dependent manner in mice. J. Clin. Invest. 121: 1471–1483.
. 2010. Rab27a and Rab27b control different steps of the exosome secretion pathway. Nat. Cell Biol. 12: 19–30, 1–13.
. 2010. 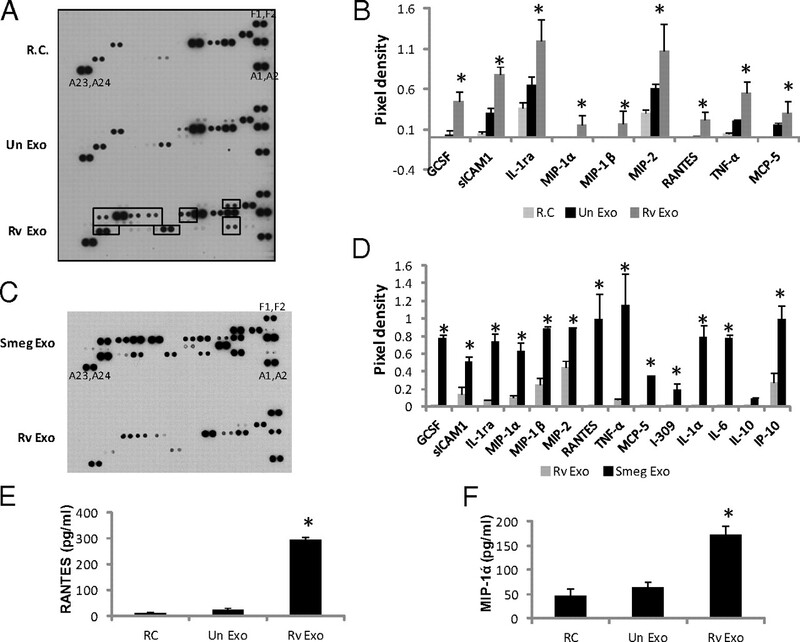 Regulation of exosome secretion by Rab35 and its GTPase-activating proteins TBC1D10A-C. J. Cell Biol. 189: 223–232.
. 2010. Exosomes from human macrophages and dendritic cells contain enzymes for leukotriene biosynthesis and promote granulocyte migration. J. Allergy Clin. Immunol. 126: 1032–1040, 1040, e1–e4.
. 2011. Microvesicles and viral infection. J. Virol. 85: 12844–12854.
. 2008. Metronidazole lacks activity against Mycobacterium tuberculosis in an in vivo hypoxic granuloma model of latency. J. Infect. Dis. 198: 275–283.